Fisher Price have always been the leaders in the toy industry, and this digital anti-shock camera for children of three and up, allows little people to awaken their sense of discovery. 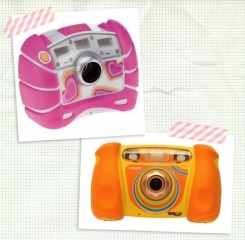 The camera shape has been specially designed for the little fingers of children, and comes with non-slip grips. The 1,3 mega pixel sensor can record 500 photographs. Photos can be printed using the PictBridge software. The model is available in pink or blue for 70 Euros. This digital camera for children is built kid tough, kids can throw it, get it wet, drop it, and it will still take perfect digital stills. The camera comes with easy to use photo editing software, allowing your children to edit their images with ease. The V Tech kidizoom digital camera is innovative, fun, rugged, and at $65, it won’t break the bank! Although these cameras are designed specifically for kids, I’m pretty sure big people will have just as much fun using these cameras!